Limited Edition 7 inch vinyl single on JUMP UP out NOW! “Shine” is taken from their new album “Heartbreaks & Shadows” (which will have in the webshop as soon as the boys get them back from the presses! 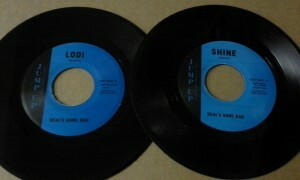 ), with a non-album b-side cover version of Creedence Clearwater Revival’s classic “Lodi”. Very cool 1960′s “private press” Northern Soul style labels too! A true collectors edition, get them before they are gone! Previous post: BROOKLYN ATTRACTORS “Good Evil Alchemy” CD/LP – All Star Jamaican Ska Jazz Reggae!